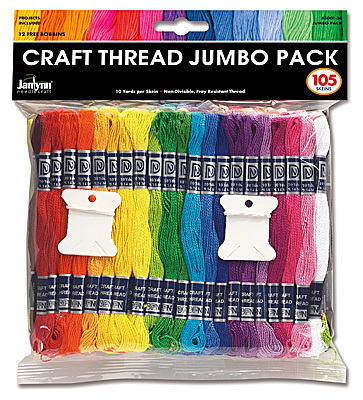 This 105 Skein Jumbo Craft Thread Pack is the best value you'll ever see! GREAT FOR SUMMER CAMPS, ARTS & CRAFTS CLASSES, PARTIES & MORE. Easy to create or craft with these Craft Thread Skeins especially at VALUE PACK prices! Great for friendship bracelets, worry dolls, key chains, shoe laces and much more. Free project sheet and 12 Free bobbins included! Each package contains 105 skeins of 10 yards each (9.14 meters) non-divisible, fray resistant crafting thread in a rainbow of 29 colors.